On a recent visit to London, I decided to have another look at the British Museum's handful of Indus objects. They are usually displayed – with little celebration, given their importance, like the first seal ever found at Harappa for example – in the South Asia gallery. Unfortunately the South Asia galleries were closed for renovation. 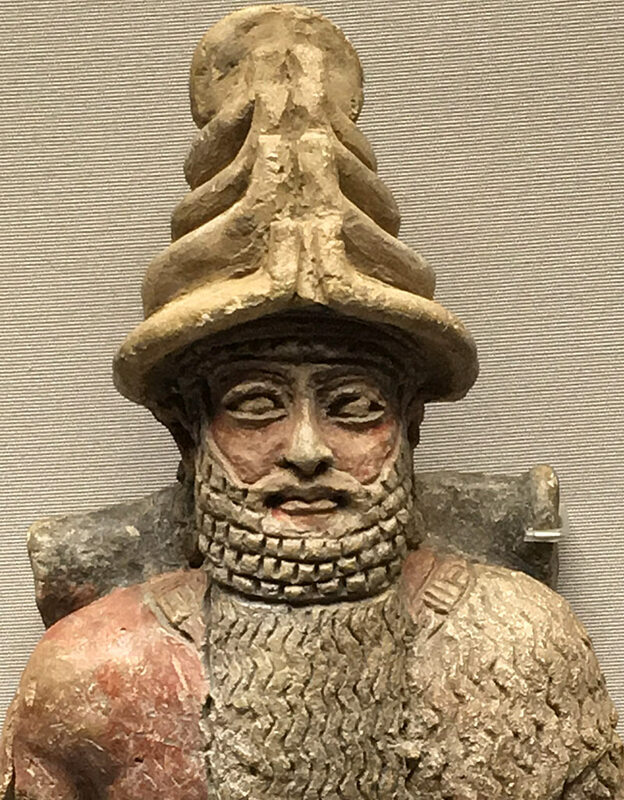 However, like on a recent visit to the Metropolitan Museum in New York, I decided to try my luck a short walk away in the Mesopotamian galleries. Once again I found some of the best Indus pieces here, in traditional royal necklaces of gold, lapis and carnelian, reiterating the deep aesthetic connections between these two systems of civilization. 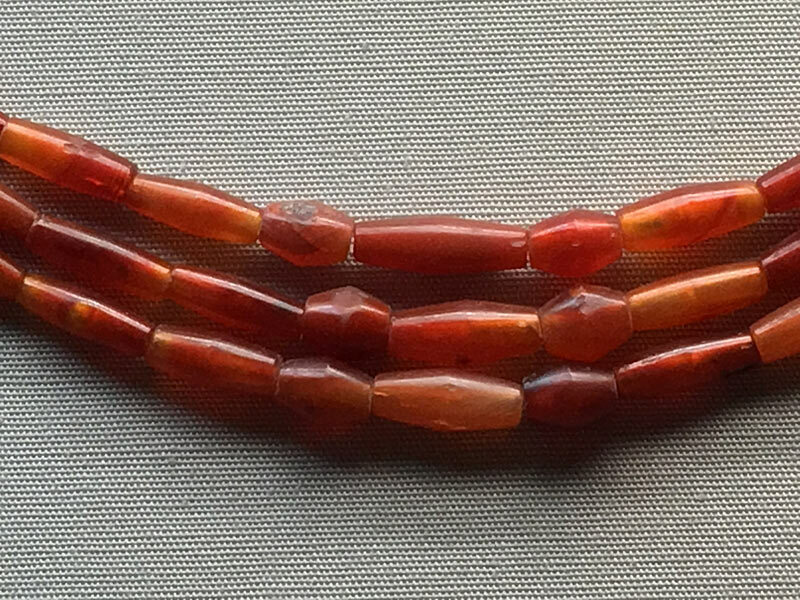 Although carnelian was found in Anatolia, Iran and later Egypt as well, the long carnelian beads here are better known from Indus cities like Harappa and Mohenjo-daro, and were probably made in the Gulf of Khambat in Gujarat. The way these three elements, gold, lapis and carnelian are played off against each other in different ways in different necklaces worn by royalty and female and male gods suggests an international world-view among the priests and elites. Perhaps it's the perennial way in which we seem to value something from a distant place. 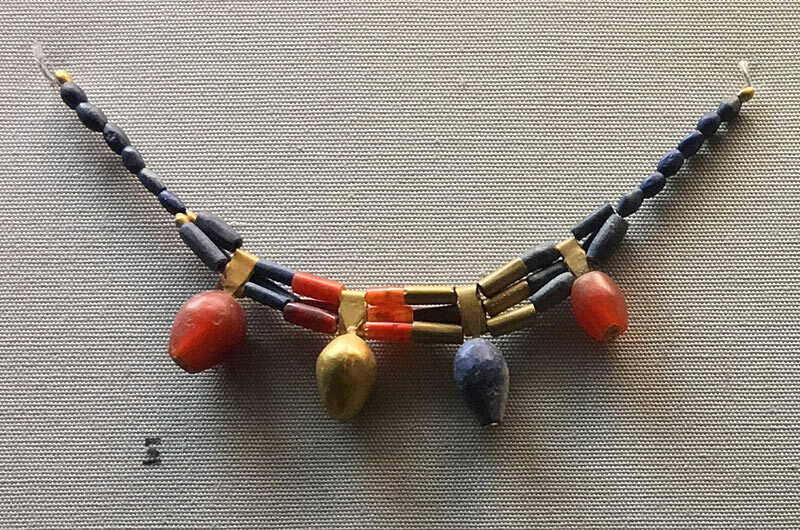 With the gold beads made in the Mesopotamian region, the lapis from Afghanistan, and the carnelian from India, Bronze Age Mesopotamian jewellery offered an early vision of globalism. Looking closely at so much carnelian made me realize what a rich and resplendent material it was, offering evidence of intense craftsmanship, more consequential than practiced on lapis lazuli, more work than stretching a thin foil over a bitumen core for the gold beads (made to a carnelian specification, in fact [see Figures 3, 5]). 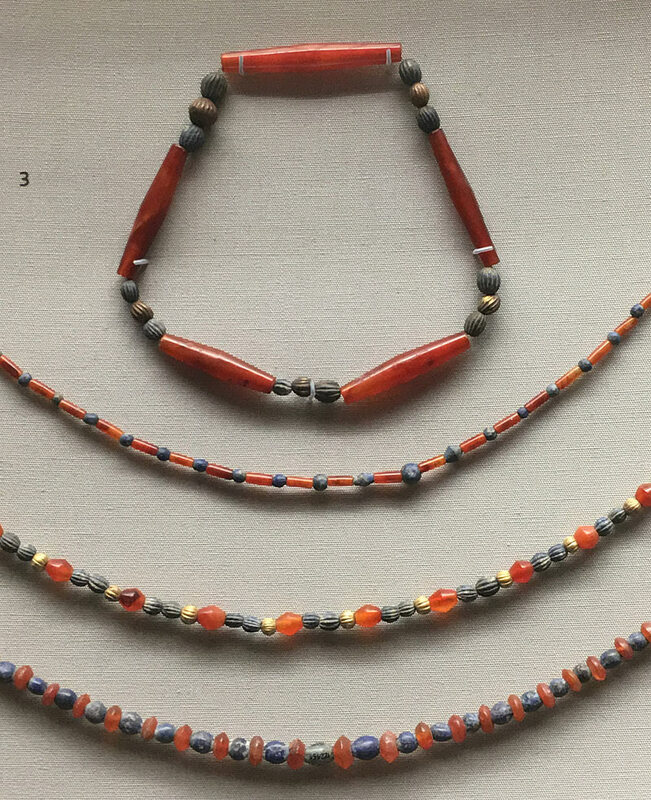 "Indus beadmakers have the distinction of producing the longest and most slender beads of carnelian in the world, prior to the advent of diamond drilling," writes J.M. Kenoyer. A single bead, up to 5 inches long, could take weeks to make from a blank piece of carnelian rock. When I hold one of these long beads in my fingers – remarkably yet understandably, they are still made in Khambat – I realize how precious each one is, how hard and apparently easy to snap, yet cold and dense in burnt orange hue. Carnelian asks you to look into the stone and what has been made of it. Lapis beads are flatter and more opaque, gold reflects; carnelian insists that you hold it up and see what happens. You can't quite do that at the British Museum, but the pieces on display give the best sense anywhere of the richness of ancient Indus carnelian art and manufacturing (the former must have driven the latter), and the shared pleasure it afforded with their Mesopotamian trading partners. The object titles and image descriptions at the British Museum are given below. 1. Carnelian beads from Royal Grave PG 580. "Grave PG 580 About 2500 BC (early Dynastic III) This tomb produced material of exceptionally high technical quality, and it may date to a slightly later time than most of the other royal tombs. No human bodies were identified in the tomb; the bones had perished. The tomb contents included many weapons and jewelerry. The jewellery techniques include filigree, the creation of elaborate shapes with gold wire, and an early type of granulation. The beads were found scattered and have been arbitrarily restrung. They reveal long distance trade; the lapis would have come from Afghanistan, the carnelian and gold from India, Turkey, Iran or Egypt." 2. Queen of the Night. "The Queen of night and other figures here wear rich jewellery" with inset, "Reconstruction of the Queen of the Night based on remaining traces of paint." 3. Gold, lapis lazuli and carnelian beads. 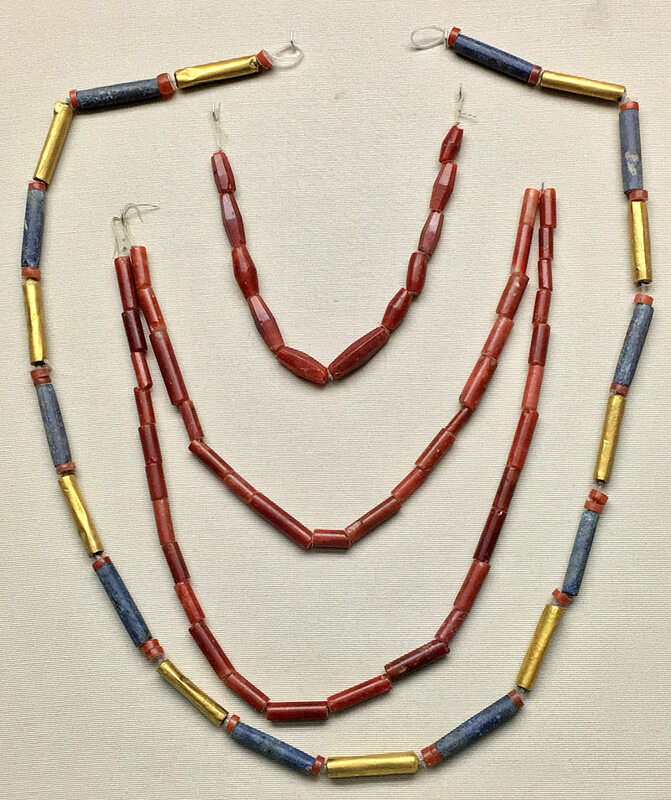 "These brilliant blue beads of lapis lazuli imported from Afghanistan, and the red carnelian from the region of the Indus Valley, may have been obtained ready-made. The gold beads are made with gold leaf covering a bitumen core and would have been made locally. Old Babylonian period, 2000-1600 BC from Ur"
4. Fragmentary statue of a god. "This fragmentary unidentified god is painted red. He sits on a black throne and wears a white sheepskin garment. These colours are similar to those used for the Queen of the Night plaque. Yellow, representing gold, was used for his headdress and for the horizontal beads of his necklace. 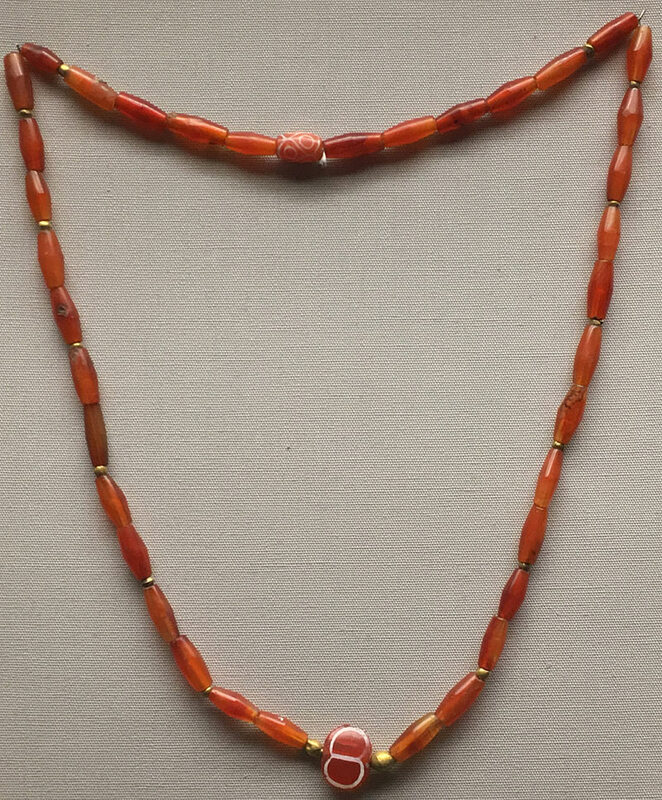 The vertical beads were coloured red to represent carnelian. Both the headdress and the necklace are like those worn by the queen. 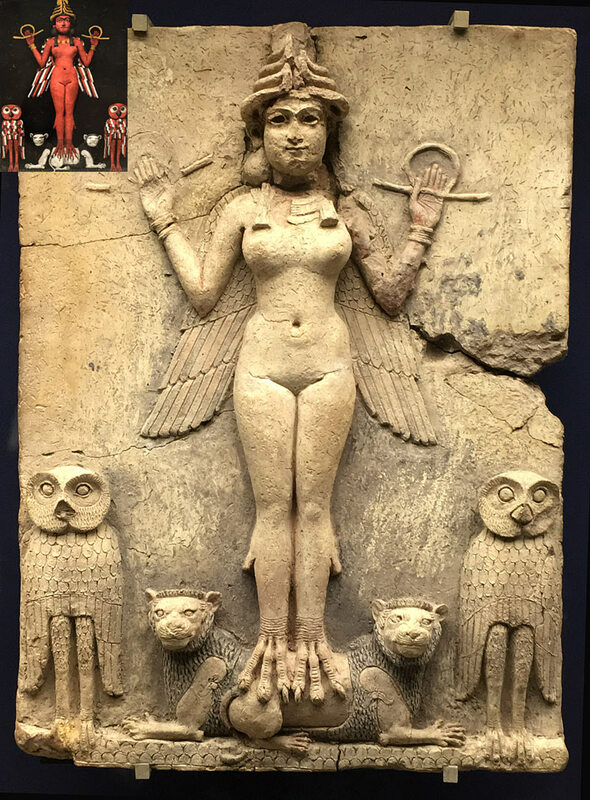 1800-1750 BC (Old Babylonian Period) from Ur." 5. Beads of gold, carnelian and lapis lazuli. "The queen's jewellery. The jewellery on this panel was found with the body of Queen Puabi herself. Her tomb chamber contained a huge quantity of artefacts. Other items are now preserved in the Iraq Museum, Baghdad and the University Museum, Philadelphia.." "Beads of gold, lapis lazuli and carnelian found by Puabi's thighs, possibly part of her belt." 6. "Beads of gold, carnelian and lapis lazuli and a few of shell. These were all found at the neck of Body C, and have been restrung." "Grave PG 1054 About 2500 BC (early Dynastic III) This was one of the best preserved of the royal tombs, with evidence for a complicated ritual involving the construction of the main chamber at the bottom of a shaft. In the chamber the principle occupant, a woman, was found with a few attendants. At higher levels above the chamber there were several separate layers of funerary offerings with further bodies, including one of a woman, Body C, who also wore elaborate jewellery. A cylinder seal bearing the name of King Meskalamdug was also found in an upper level of the filling of the tomb." 7. 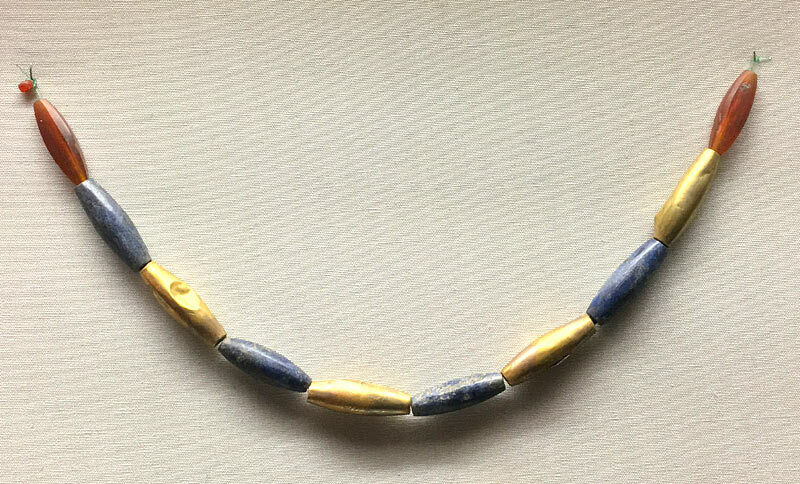 Lapis, gold and carnelian choker. Note how there are gold, lapis and two carnelian versions of the large beads. 8. Gold and carnelian beads. "The two beads etched with patterns in white were probably imported from the Indus Valley. They were made by a technique developed by the Harappan civilization." More from the British Museum, whose Indus objects are not easy to find online. but which has a Teaching History page for seals.